(Apparently) I am the next big thing! A little over a week ago, I was tagged into an circulating set of questions among independent authors called "I am the Next Big Thing." I don't consider myself to be destined for any level of greatness, but I did appreciate the opportunity to talk about my upcoming book. I'm having a blast writing it, and would like to provide a few bits of information on it. So here we go! 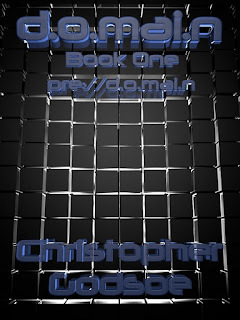 -It is pre://d.o.mai.n, the first book in my d.o.mai.n series. -It's been a slow process, taking shape over more than a decade. The original story that I had in mind is actually the second book in the series. As I was writing it (initially as a screenplay), I discovered that I had just thrown the character of Miles Torvalds into the mix without really setting him up well. Miles is an angry guy, and I thought that story should be told before I got into the meat of the main “meta” narrative. As I began fleshing out Miles' story, I discovered just how perfect a starting point it was. My goal is to convincingly depict the evolution of our technologically driven society, starting with this book and Miles problems, which are very localized, and end at the natural conclusion of that technology on a grand scale. -Hard SF. Hard as in technical science fiction, leaning more towards specific advances in technology than in the more “because it's high tech wizardry, that’s why. Stop asking so many questions!” forms of SF. -His mother is dying, and the only way for Miles Torvalds to save her is to put his own future in jeopardy, to become a thief in order to right the wrongs of an unjust society and hope that he can complete his task before time runs out. -I have a couple of agencies in mind that I will submit to, but if they choose to disregard it then I have no qualms about going the self-published route like I did with COVINOUS, if they want to make drastic changes to the story line, I'll take it back and publish it myself as well. Still writing, actually! But I'm over halfway done, and it's coming along great. -Thats really hard to say, as I've consciously tried to do things in this book that haven't been done before. I guess the closest I can think of on short notice would actually be a film-the second Matrix movie, The Matrix Reloaded, but that’s just because it involves a sf/cyberpunk motif with a main character that is trying to save someone he loves from certain death. -My son. He's like me in so many ways, and I realized early on that in writing a book that I would want to read, that he would want to read it as well. I also realized that there aren't a lot of terrestrial-based Hard SF books out there. Most of them nowadays are heading into space. There are some authors, such as Hugh Howley and William Gibson, that still choose to keep their feet on the earth while exploring the social interactions that evolve through technology, and that's what I'm looking to do. I think we are in an interesting Geo-political time, where barriers are coming down, bringing the curtain with it. Smartphones are putting eyes and ears everywhere, and personal privacy is something you have to afford rather than a right you are owed. I just think there are an endless reel of stories to be told, even only going thirty years into our future. -Well, like I said, this is the beginning of a series. The first story, pre://d.o.mai.n, is written trying to keep the scope very personal. My vision for this series is to go from small to big with the scope, to bring the reader from the technology of tomorrow to the technology of 30 years from now, and to take a look at what the implications of that technology will be as it evolves. This story revolves around Miles Torvalds, a young man who has been trying to find a way to pay for a life-saving cancer surgery for his mother. Their health insurance was dropped using one of those ever-expanding loopholes, and Miles has been left with limited avenues to pay for it. He has to make some tough choices along the way, and no one will make it out of the book unscathed. The real world doesn't involve clear-cut victories very often, and my goal is to provide the kind of characters and stories that people can identify with, because as much as this book is about the wonders of the future, it's also equal parts cautionary tale. And by the rules of the chain, I am compelled to share this honor with five of my fellow authors.